Today is Good Friday. I am not deeply religious but I do respect and practice what is expected of us Roman Catholics during the Holy Week. I suppose it’s not just because I grew both my first permanent tooth and my first white hair with nuns (i.e. I spent an insanely large amount of time with nuns). My natural inclination to observe the Holy Week may be due to the fact that my mother is from Bantayan island. The island is popular not just for its unexploited white sand beaches. Nearly everyone has also heard of the way the island is transformed during Good Friday. On this day the island comes alive with preparations for the evening procession. At the appointed time, residents and visitors take to the streets bearing candles and reciting prayers. The sheer number of people and candles dotting the streets seem to set the island on fire. The main attractions though are really the celebrated floats that depict various personages and scenes from Christ’s passion and death. The rich, elaborate and superfluous details on each float can make anyone forget to maintain the appropriate gravity prescribed by tradition, the occasion and the elderly. Some figures of saints are rumored to be made of ivory and cost anywhere from 2 to 3 million pesos each. 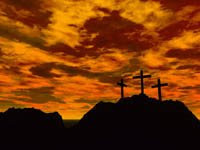 The grandeur on Good Friday is only half of the story. The other half is within the realm of gastronomy. I am ashamed to say that part of the reason why I cannot forget Holy Week in Bantayan is because I am often ruled by my stomach. Like other Catholics, my relatives and I have always fasted and abstained as a sign of sacrifice, eating only three meals without pork and beef. It is generally assumed that pork is a major tasteful pleasure so abstaining from it is a great sacrifice for many Filipinos. Personally though, Bantayan Holy Week table fares hardly fit my notion of sacrifice. How could it be a sacrifice to sink my teeth in seafood that is so fresh that they move and struggle to escape only moments before being decapitated? It was a guilty pleasure to forsake pork and settle for white fish steamed in plain water or shells grilled in their own juice. Bantayan, in any week of the year can make you forget that pigs, chickens and cows are edible. Incidentally, it is due to the abundance of seafood and the obviously diminished island pig population that the people of the island are said to be exempted from abstaining from pork meat on Fridays during the Lenten season. For me though, eating pork in the face of the sea's abundance is more of a penance. It is perhaps because of the general atmosphere in the island during the Holy Week that outsiders call the week the island’s fiesta. For some islanders, this is an obvious insult. While people all over the country bear somber, penitent faces on Good Friday the Bantayan islanders are sometimes thought to be in a state of enjoyment. Nothing can be farther from the truth. I have never met more pious and faithful people in my life. What is sometimes seen as inappropriate celebration is really a rich commemoration of Christ’s life and sacrifice. It's great to hear that some people remain 'meditative' during Holy Week. Although I did hear Mass at the parish near our dorm, I still feel - um - a bit guilty for spending most of my 'reflection time' reading HP fan fiction and playing Harvest Moon. Tsk, tsk. Harvest moon! I spent the week 'meditative' waking up 2pm in the afternoon. I ate meat and lazed round. OMG! Ma'am what happened to princess sophie!? hehe. Tellya more about it later. Email me your interjections. okay the url wont show up fully on the board so just read the platypus' recent blog in multiply k? um, sofi's small intestines had a seizure and left wet droppings averywhere for seven days. hehehe. in other words she had lbm that just wouldn't stop. nagulat din kame ng mama ko na they eat pork, and they are allowed by the church, during holy friday. i am not that religious too, i was nung bata, i don't know what happened. actually nanaginip yung mother ko that i'll be a nun, i don't know, yun lang sabi ko. :) oo surprising nga yung exemption pero everytime nandon ako seafood lang kinakain ko kasi mas masarap pa sa baboy. peksman. lookit me. I'm riding the waves ma'am! Guess who got a tentative job offer as the platypus' slave/assistant this June. ;-) have my fingers crossed. hehehe. goodluck mary. i hope you don't drive each other crazy. Oh dear, i feel like a block is sitting on my heart. it's so weird. a cyber friend just said goodbye and i actually feel more terrible about it than when an actual "physical" friend said goodbye. is this what the internet does to people? so twisted man! Apparently somebody has some tight cyber relations... I wonder what else goes on over the net? hmmm? no go on the internship anymore ma'am. Sigh apparently he realized he'll be too busy this June doing other stuff so he can't train me. tsk. To make up for it, he and the prez of the comics club promptly piled a huge workload that will take up my whole summer. Joy. hahaha cuttlefish. i don't know what i enjoy doing. i think i'm too old to be in a rock band or something (although i heard ariel pineda is 40 but he's singing for an oldies band). i hope one day something will come. i don't wanna live life like it were just the hours between birth and death. Oh Gawd Ma'am you have no idea. Will elaborate personally.